The Montmorency cherry is a popular tart cherry tree grown in the United States. The tree is hardy in USDA growing zones 4 through 7 and can be planted singly as it is a self-pollinator. Space multiple trees 20 feet apart as the trees grow up to 15 feet high and 20 feet wide. 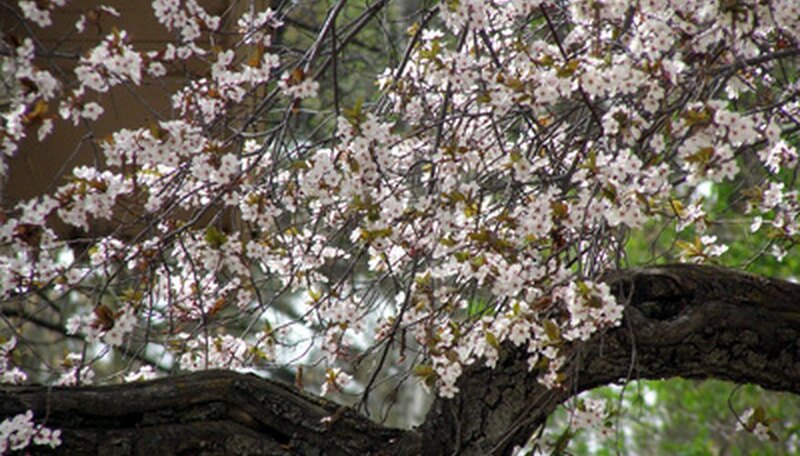 Montmorency trees bloom in late spring and produce fruit two months later. Select a planting location for the Montmorency cherry that has a well draining, sandy loam-type soil and full sunlight. Test the soil pH as the tree prefers a slightly acidic soil of 6.2 to 6.8. Add ground rock sulfur to lower the pH number or limestone to raise the pH number. If you have amended the soil let it rest for two or more weeks prior to planting the tree. Dig a planting hole that is twice as wide as the cherry tree's root ball and the same depth. Mix organic compost or peat moss into the removed soil to increase the nutrient value and moisture retention qualities. Sprinkle several handfuls of bone meal into the hole. Cut injured roots from the root ball and set the tree into the hole. Gently pack amended soil around the root until the hole is half filled. Fill the remaining area with water and allow it to be absorbed into the root ball and surrounding soil. Continue to pack soil around the root ball once all water has been absorbed. Water the tree well after planting to compact the soil and remove air pockets around the root ball. Water the tree weekly during the hot summer months to promote the development of a strong root system. Remove all weeds and vegetative growth around the base of the tree in a 4 foot diameter. Apply a 2- to 3-inch layer of mulch around the tree, leaving a 4-inch gap between the start of the mulch and trunk of the tree. This will prevent weed growth and increase moisture retention.